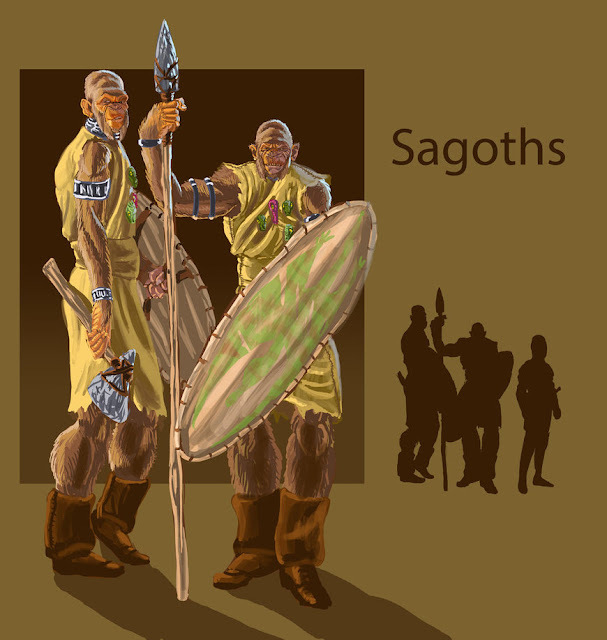 Hollow Earth Cultures: Sagoths from the Pelludidar series by Edgar Rice Burroughs. They're the apish servants of the Mahars. "Behind them, streaming through the pass which leads into the valley, came a swarm of hairy men—gorilla-like creatures armed with spears and hatchets, and bearing long, oval shields. Like demons they set upon the ape-things, and before them the hyaenodon, which had now regained its senses and its feet, fled howling with fright. Past us swept the pursued and the pursuers, nor did the hairy ones accord us more than a passing glance until the arena had been emptied of its former occupants. Then they returned to us, and one who seemed to have authority among them directed that we be brought with them." "Our guards, whom I already have described as gorilla-like men, were rather lighter in build than a gorilla, but even so they were indeed mighty creatures. Their arms and legs were proportioned more in conformity with human standards, but their entire bodies were covered with shaggy, brown hair, and their faces were quite as brutal as those of the few stuffed specimens of the gorilla which I had seen in the museums at home. Their arms and necks were encircled by many ornaments of metal—silver predominating—and on their tunics were sewn the heads of tiny reptiles in odd and rather artistic designs. They talked among themselves as they marched along on either side of us, but in a language which I perceived differed from that employed by our fellow prisoners. When they addressed the latter they used what appeared to be a third language, and which I later learned is a mongrel tongue rather analogous to the Pidgin-English of the Chinese coolie."